Hello there Peeps! 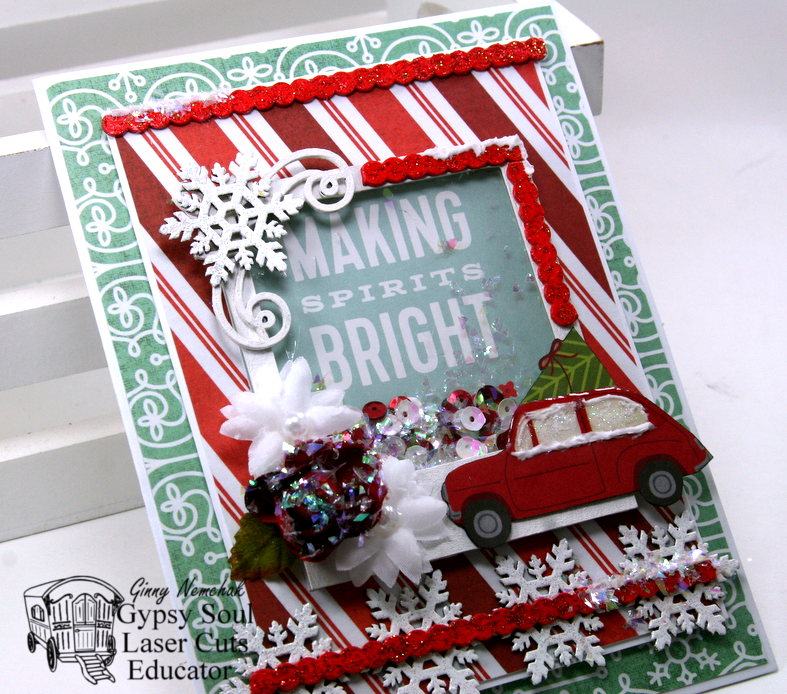 Well I’m going out with a bang for my Christmas in July projects and sharing four in the same post! Of course I planned to share one every day….but the heat and humidity had me not in the mood to write posts…so this is the only way to get caught up. This might be the most traditional card I’ve posted so far..and on the last day too! I’m combining a swell gingham with what I can only describe as sweater pattern. Is there a name for it? I’ve only ever seen it on Christmas sweaters so that’s what I’m going with. I’ve got more of the sweater pattern here but this time paired with buffalo check. To ensure that the focal images remain the star of the card I’ve layered them over doilies to separate the busy patterns. Red doilies? Yep I went there too. And just check out that awesome snowflake ribbon..I am swooning. Last but not least……this card is my favorite of the batch because that image just yells Christmas with the gloves and cocoa and candy cane. Those gorgeous flowers coordinate so perfectly and the leaves bring a welcome pop of green. Really Reasonable Ribbon~ Snowflakes on Red Satin, Wavy Vertical Stripe Green/White Satin, Red Cherry Blossoms( I died the centers gold) White Tuscany Roses, Scor-Tape, WOC Leaves, Tombow 3D Foam Squares. Hello Peeps! Taking a break today from the Christmas in July posts to bring you this very charming Birthday card. I’ve fallen under the spell of the Paper Dolls and this cheeky little fella just caught my eye as I was sorting through them. Isn’t he just the cutest????? What a sweet little outfit and buckle shoes. 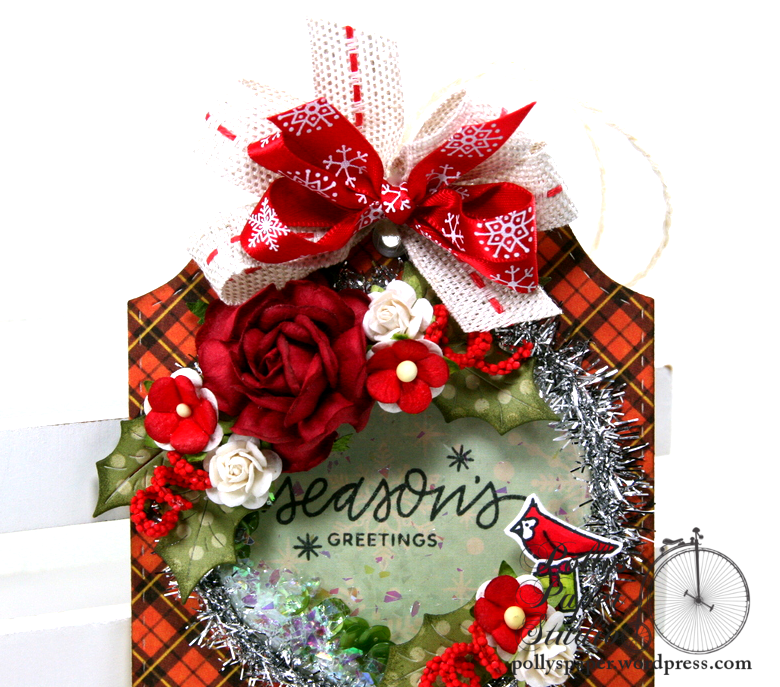 He’s layered over a printed die cut with a flowery border strip on top. The inside is finished with coordinating papers. An altered chipboard butterfly becomes wings for this darling little man. Coordinating flowers and twine fill in this corner nicely. Birthday sentiment strip is layered over flower die cuts, another butterfly then topped off with additional dimensional flowers and pearly accents. Well helloooo there Paper Peeps. Ginny here with another installment of Christmas in July and this time I’m using a garden full of flowers from Really Reasonable Ribbon along with trims of course. This is just so cheerful and sweet. I stamped and colored those little images. I do love to color. Did I mention this is a shaker tag? I’m slightly obsessed with them right now. Inside are coordinating sequins and Shaved Ice. These little cuties were a bit lost on the busy background pattern so layered in a bit of a snowy border hill for them to stand on. So. Many. Flowers. 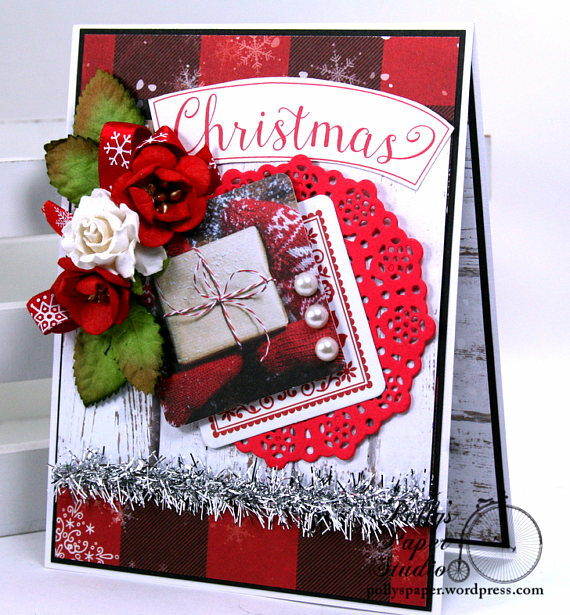 Isn’t the burlap trim a wonderful texture behind the snowflake printed satin? I added a bit of tinsel trim for extra sparkle and included a twine loop to hang. Really Reasonable Ribbon~ Tea Rose in Red 40 mm, White Open Roses 15mm, Sweetheart Blossoms in Red, Spiral Stamens in Red, Burlap Center Stitch Red, Snowflakes on Red Satin, Scor-Tape, Tombow 3D Foam Tabs. Pretty Pink Posh~Christmas Friends Stamp Set, Mossy Green Sequins. Hey there peeps! 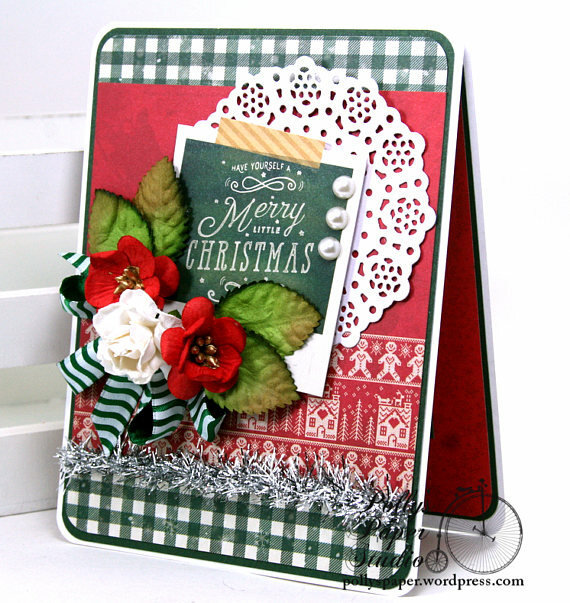 I can’t believes I’m this far into Christmas in July and haven’t created a shabby chic card until now. Must be the heat lol. I’m about to remedy the situation now and share this oh so light and dreamy card with a snow angel. 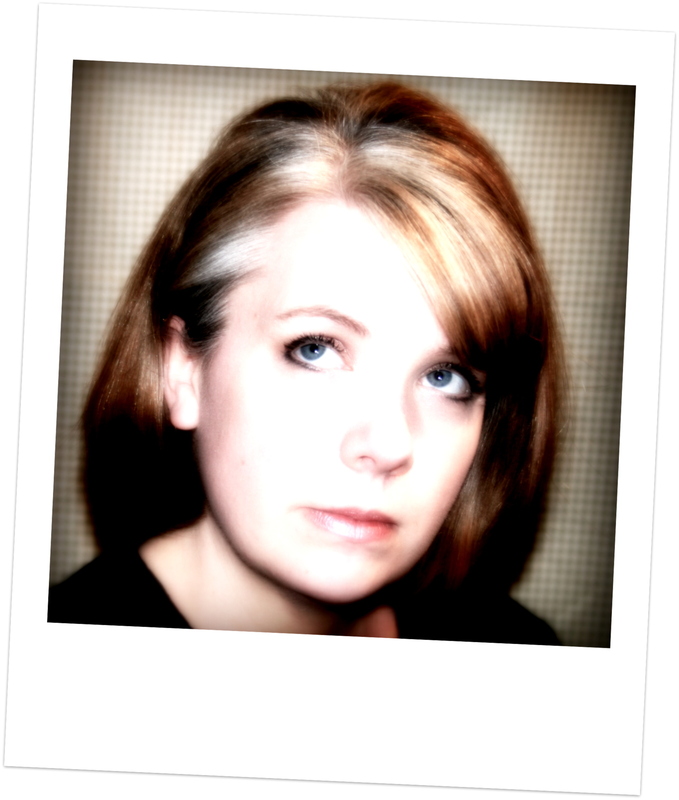 I’m layering gray and white with the lightest blush pink to create a creamy color palate. This charming little snow angel is from the Winter Wishes collection from BoBunny. I’ve given her coat a nice layer of Sugar Glitter Paste so she looks like she’s out in the fresh snow. These chippies were altered with mermaid tail embossing powder and heat set to look a bit like glass glitter. 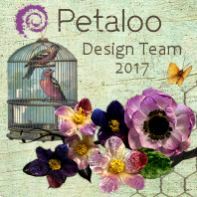 Gorgeous flowers from Petaloo with a glittery finish to compliment the frosty effect. Layering the tiny tree die cuts from the paper collection and topping them off with a nice sprinkling of pearls. 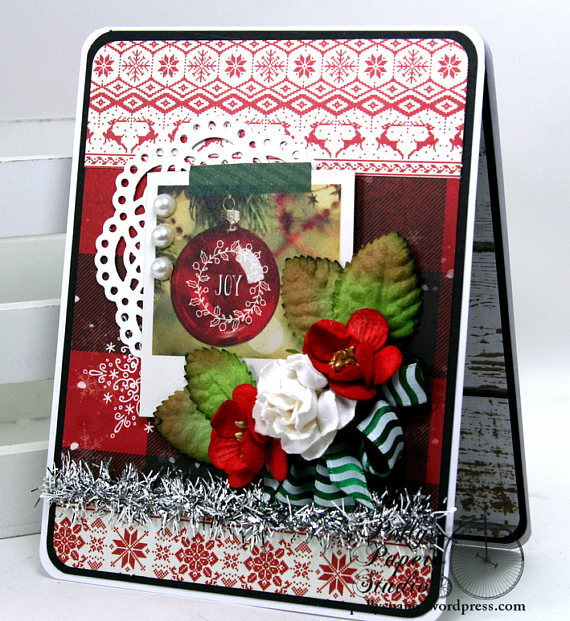 This chipboard sentiment has a printed snowflake and a blingy accent. 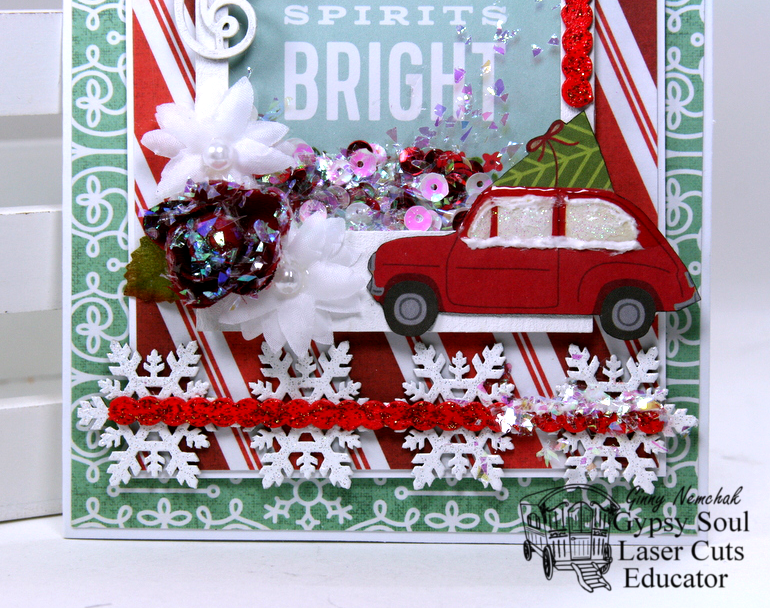 Last but not least….I’ve dabbed a fair bit of the Sugar Glitter Paste on the edges of the papers and tucked in a sweet little bow of seam binding and loops of twine. BoBunny~ Winter Wishes Collection, Sugar Glitter Paste. 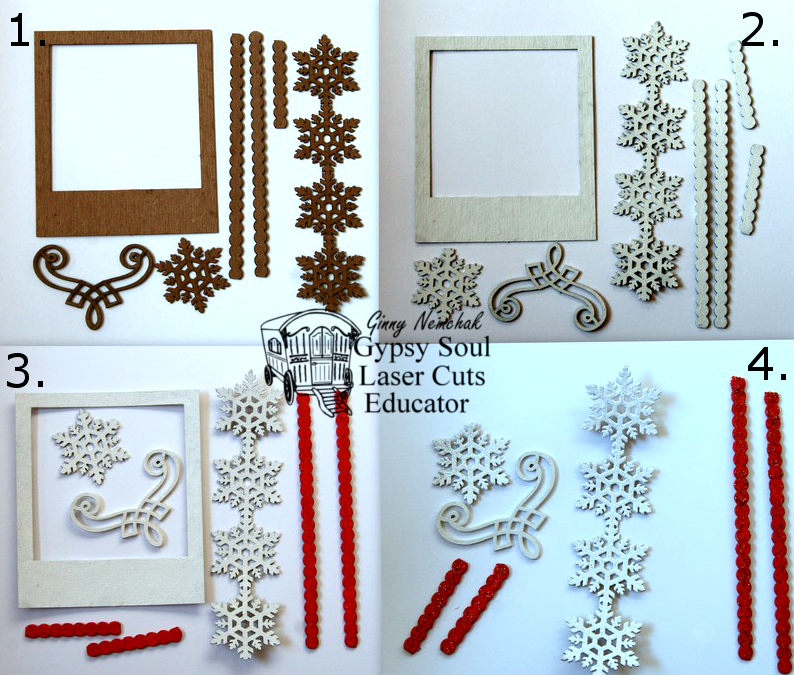 Gypsy Soul Laser Cuts~ Winter Shapes Set, Decco Art Corners. Hey Peeps! 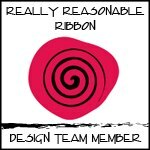 We’re starting a new Anything Goes with Ribbon or Trim Challenge at Really Reasonable Ribbon. Okay. I’m just gonna say it. This may be the coolest graduation card ever. At the least it’s the coolest one I have ever made. This card was gifted to an awesome young man who is a friend of our youngest Son and a fellow Boy Scout. We are super proud of him. He has a very bright future I’m sure : ) Well done Zachery!!! Did I mention it’s a shaker? And did I mention that I die cut and embossed those stars with a shiny silver finish? That’s how you an tell how much I like this young man. I wanted the Pirate P to be inside the shaker…but I didn’t want it to get turned over or stuck in a carner so it’s secured in place with fishing line. That’s one cool dude! we really have great school colors. Easy to find and work with and photograph. Now it’s your turn to create an Anything Goes project and link up with us to play along. Well hello there Peeps! 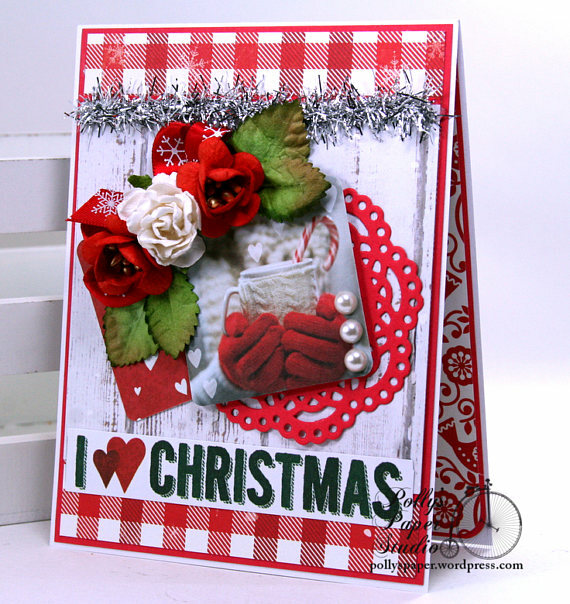 I’m back to share more cards for Christmas in July. I know I know…I wanted to share everyday…….but it’s just been boiling hot here and I’ve not been in the mood to write posts. I have been creating the cards though so today I’ll be sharing 3 to help me get caught up a bit. Isn’t that cheeky of me? Posting an it’s cold out side when it’s actually super hot and humid? Brown and blues are a very nontraditional color scheme…but I just love it. I think it’s warm and woodsy. I’ve added pretty ribbon and flowers and sequins and the fabulous gold striped washi tape. This card is just too sweet. I mean anything with a gingham print papers and doilies is gonna be good right? 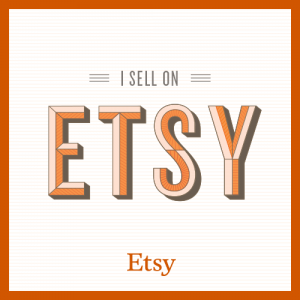 Okay that’s a little help to get me caught up…..be on the look out for more Christmas in July projects while I work through the rest. Really Reasonable Ribbon~ Light Blue Chevron Stripe on Twill, Red Chevron Stripe on Twill, Light Blue Burlap String, Ivory Burlap String, Red Sweetheart Blossoms, Baby Blue Open Roses, White Open Roses, Scor-Tape. Hello there Paper Peeps! Well I’m still in full swing of my Christmas in July. I’ve got more retro vibe today with this non-traditional mix of colors. And it’s a shaker card!!! Isn’t this just super fabby? 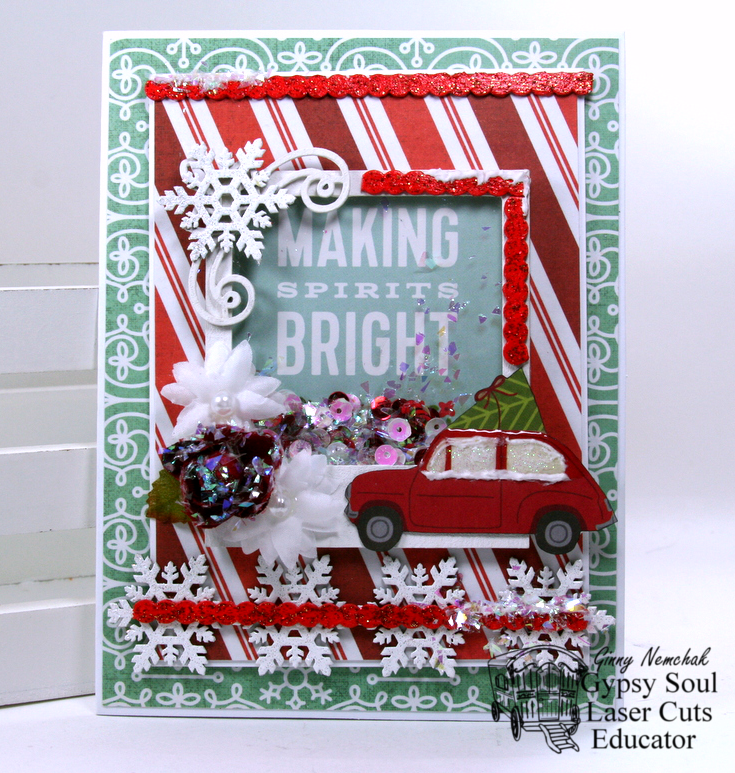 I love that little car so much it was the inspiration for this project. I’m obsessed lately with layering the chippies to create very unique and one of a kind frames and embellishments. 1. Thoroughly wipe down the chippies to prepare them for finishing. 2. Each piece was given a base coat of flat white acrylic paint and allowed to dry. 3. The Bead Strand pieces were painted in bright cherry red acrylic paint. 4. 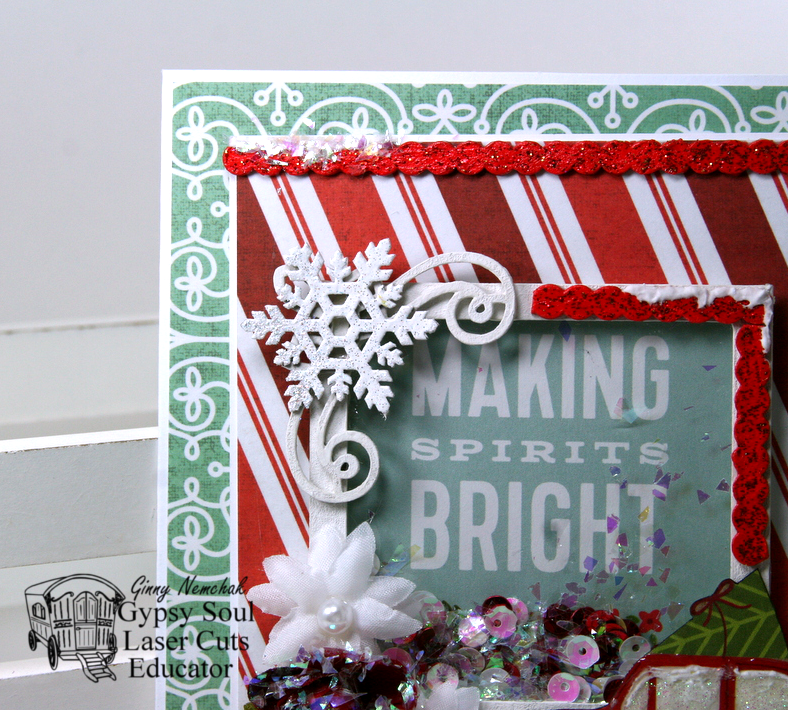 The snowflakes were given a coat of sparkly embossing powder and heat set. The Bead Strand pieces were topped with a layer of Stickles. 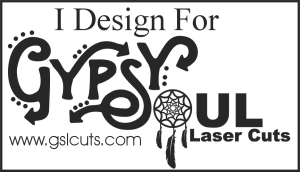 Gypsy Soul Laser Cuts~ Bead Strands ( Coming Soon),Victorian Corners, Winter Shapes Set, Word Frames.